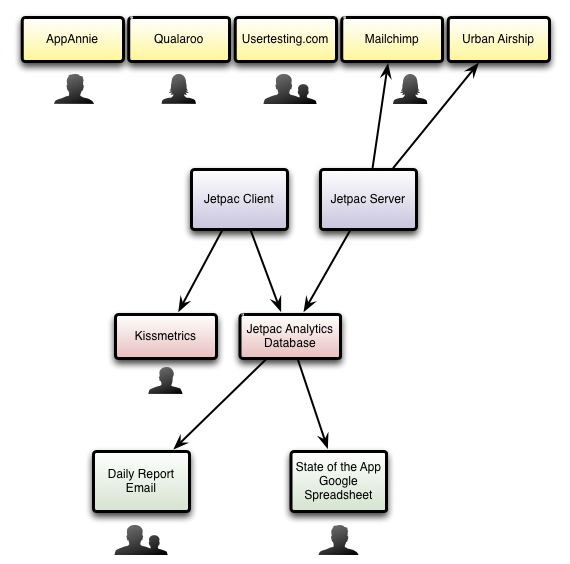 How do analytics really work at a small startup? I was lucky enough to spend a few hours today with my friend Kevin Gates, one of the creators of Google's internal business intelligence systems, and it turned out to be a very thought-provoking chat. His mind was somewhat boggled that we were so data-obsessed at such an early stage in our life. Most people running analytics work at a large company and have a big stream of users to run experiments on. Our sample sizes are much smaller, which makes even conceptually simple approaches like A/B tests problematic. Just waiting long enough to get a statistically-significant results becomes a big bottleneck. We've found ways around a lot of the technical issues, for example focusing on pre/post testing rather than A/B to speed up the process, but there's a bigger philosophical question. Is it even worth focusing on data when you only have tens of thousands of users? The silhouettes show where people are looking at the results of our data crunching. The primary things that everyone on our team religiously watches are the daily report emails, and the UserTesting.com videos that show ordinary people using new features of our app. The daily reports are built on top of our analytics database, which is a Postgres machine with a homebrewed web UI to create, store, and regularly run reports on the event logs it holds. We built this when our requirements expanded beyond KissMetrics more funnel-focused UI, but we still use their web interface for some of our needs. Qualaroo is an awesome offshoot of KissMetrics that we use for in-app surveys, and we also refer to MailChimp's Mandrill dashboard and Urban Airship's statistics to understand how well our emails and push notifications are working. We have to use AppAnnie to keep track of our iOS download numbers and reviews over time. We also have about twenty key statistics that we automatically add to a 'State of the App' Google Docs spreadsheet every day. This isn't something we constantly refer to, but it is crucial when we want to understand trends over weeks or months. Over the last 18 months we've experimented with a lot of different approaches and sources of data, but these are the ones that have proved their worth in practice. It doesn't look the same as a large company approach to analytics, but this flow has been incredibly useful in our startup environment. It has helped us to make better and faster decisions, and most importantly spot opportunities we'd never have seen otherwise. If you're a small company and are feel like you're too early to start on analytics, you may be surprised by how easy it is to get started and how much you get out of it. Give simple services like KissMetrics a try, and I bet you'll end up hooked! « How good are our geocoders?